Chelsea boss Jose Mourinho says his side "have no chance" of winning the Premier League title despite them beating leaders Liverpool to move within two points of top spot. The Blues sit second in the table - one point ahead of Manchester City who have one game in hand - after goals from Demba Ba and Willian completed a 2-0 victory at Anfield. 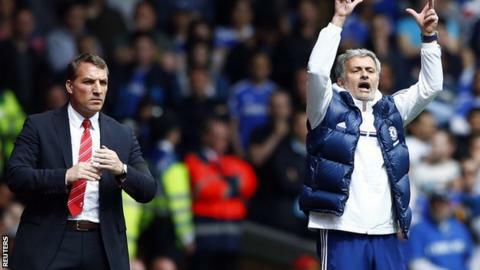 "We are not in it," said Mourinho, whose side have two games remaining. "The champions will be Liverpool or City. We have nothing to celebrate." The Portuguese added: "Today was an important three points and we need one more to finish third." Third place ensures the Champions League semi-finalists, who finish their league campaign with a home game against Norwich and a visit to Cardiff, would not have to play any qualifying matches in Europe's elite club competition next season. The Blues, who face Atletico Madrid in the second-leg of their last-four Champions League tie on Wednesday, arrived at Anfield amid speculation Mourinho would rest players and play a weakened team, despite the magnitude of the fixture. Defeat would have ended Chelsea's hopes of winning the title they last claimed in 2010, but late goals in each half ensured they are still contenders, despite Mourinho's reluctance to admit so. "Now we can say we have won both matches against the champions," added Mourinho, whose side have beaten Liverpool and Manchester City twice this season. "The team that deserved it more won. Obviously many people would be expecting us to come here and lose three, four or five nil like others. Many people thought it was impossible to get this result." Mourinho gave 20-year-old Czech Tomas Kalas a debut in central defence against the Reds and praised "a giant" performance from Demba Ba in attack. The Portuguese, whose side have claimed 16 points from 18 against the Premier League's top four sides this season, denied his team time-wasted on Merseyside and disagreed with the notion they used defensive tactics. "I'm a bit confused with what the media thinks about defensive displays," said Mourinho, a winner of league titles in four countries. "When a team defends well you call it a defensive display. When they defend bad and concede two or three goals, you don't consider it a defensive display and sometimes they are. "My team played brilliantly, every player was magnificent. No mistakes."